This Sporty 50cc Gas Scooter is an eye catcher! Riding around on this scooter just may as well be like riding around in a sports car. Don't be fooled by it's stylish looks, this scooter is full of performance. 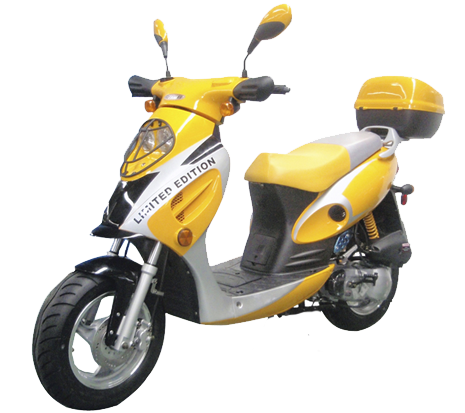 The 2 stroke engine makes this one of the fastest 49cc scooters available today. Upgraded 12 inch wheels make this one of our most popular units for 2017. Save on gas, fun to ride and handles like a dream. Did we mention 90 miles per gallon? This model is equipped with a sport tuned suspension (STS) that will allow you to make sharp turns, ride on rough terrain and maybe a few bump hopping. Pleny of leg room for the big & tall. If you want a fun, reliable and good looking scooter, this one is for you! BE A RESPONSIBLE RIDER! FOR SAFETY, READ YOUR OWNER'S MANUAL. ALWAYS WEAR A HELMET, EYE PROTECTION, AND PROTECTIVE CLOTHING! NEVER RIDE UNDER THE INFLUENCE OF DRUGS OR ALCOHOL! ATV's - Parents consider your youngsters age, size, ability, and maturity before allowing them to ride. SCOOTERS, MOPEDS & MOTORCYCLES - Never ride on non-paved streets or non-public roads, and never carry passengers on your moped unless equipped to do so. Never engage in stunt driving or ride at excessive speeds. Be careful on difficult terrain. Riders under 16 years of age must be supervised by an adult. CountyImports.com recommends that ALL riders take a training course. For more information visit the ASI website safety.org/ We have a put together a great collection of actual course study information, videos and guides. You can have your children watch our atv and four wheeler safety videos anytime for free! We know you work hard for your money. We also understand the need for peace of mind in a purcahse. Now, you have the power to customize your own warranty protection to fit your needs. As a standard, we always offer a free warranty of every single product we carry. We also carry parts for these products.. After over 5 years and over 25,000 customers served, we know what coverage will best service you the customer. When adding this item to your shopping cart you will be asked to select your warranty coverage. Remember, there is always a FREE standard warranty offered with every purchase, however we also offer longer coverage periods. Please keep in mind you must PRINT OUT the warranty agreement, sign and mail -or- fax it to our office to become active. We suggest you complete this and mail it while waiting for your new unit to arrive! This way from day one you are covered! Here are the following warranties available. Please note any warranty offered is a parts only warranty. Unless you purchase directly instore from CMS or can bring your machine to our location for service. This warranty however long the term you select will cover everything noted HERE. Please feel free to contact us for assistance or with questions. While your account is active and eligible, if your engine fails to operate at any time, county imports will replace the engine and pay up to five hours of labor to exchange the engine on your vehicle. A diagnosis must be provided by the customer detailing the problem and the necessity of a replacement engine, performed by a licensed, brick and mortar repair facility. County imports must be furnished with a detailed explanation of the problem on the certified mechanic’s letterhead, and provided with the faulty engine, at the expense of the customer. This guarantee is valid for one use per enrollment. The engine guarantee period is for a term of 5 years or 20,000 miles, whichever comes first. Customers may cancel the guarantee at anytime at no charge, unless a replacement engine has been issued. If a replacement engine has been issued, there will be a $100 cancellation fee. Are the publicly traded? Do they have 3 Physical Store locations? How about a parts department with over 60,000 parts in stock? We may be bragging a little but we are very proud of our company and what we offer becuase we know out right, noone else can asker yes to those questions we can! Most other online dealers will ship your scooter to a terminal which could be hours away from your home, ours get shipped directly to your door. CMS also provides lift gate service at no additional charge. This means your new purchase will arrive directly to your residence at NO EXTRA COST! CMS offers our product at a wholesale price. For each items specifications and assembly requirements please see each individual item description for what assembly is required to complete this purchase. Although assembly is generally easy depending on the model if you cannot perform this task please let CMS know so we can help find a dealer in your area to perform this task. Should you have any questions about our product feel free to call us anytime during normal business hours M-SAT 9 am- 5 pm PST - 877-300-8707 . Please GO HERE for our FAQ department.